CLEVELAND, Tenn. - A church, a martial arts studio and a bouncy playworld aren't necessarily the first places you'd go to shop. Yet the businesses represent a cadre of untraditional tenants that have found a home at Bradley Square Mall in the past year. 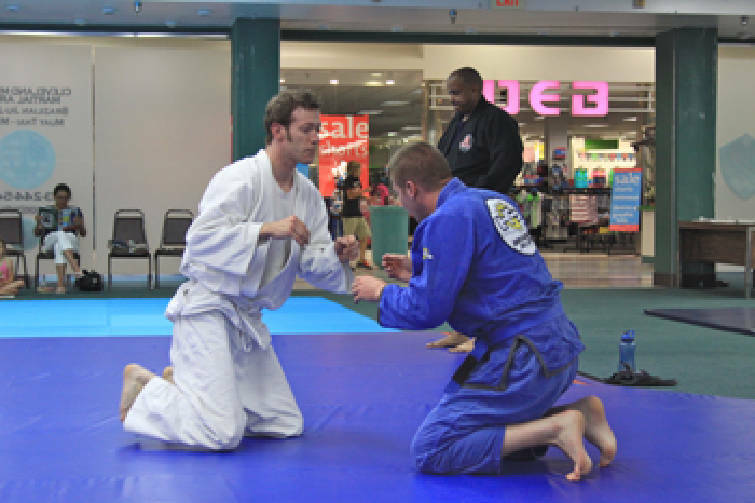 Staff Photo by Harrison Keely Chris Grice wrestles J.P. Allman at Cleveland Mixed Martial Arts in the Bradley Square Mall. Opening to organizations that aren't strictly retail is a strategy designed to keep people in the mall, said Jennifer Sparrow, the mall's marketing manager. "Rather than closing the doors to different types of retail, we've embraced the nontraditional concept," Mrs. Sparrow said. "It's a way to be creative in a time (when) getting turnover for retail is not the best." Of the 60 retail spaces in the mall, about 10 now are vacant. The recession brought on changes, Mrs. Sparrow said. A 12-screen movie theater planned for construction at the mall two years ago was put on hold indefinitely, she said. One of the new properties, Cleveland Mixed Martial Arts, opened on the site of a bridal shop that eventually closed. Owner Tommy Wales said it represents a shift from selling products to selling services at malls. While malls once had a stricter definition for shops, times have changed, Mrs. Sparrow said. The focus now is on creating community, she said. Mr. Wales said his gym has no need to buy advertising, adding that just being seen in the mall is enough. "Man, they just pile up right out there in the hallway," Mr. Wales said. "Within eight months we've grown from 11 to 80 students. Typically, that takes a year and a half." He said starting his business in an isolated location would have meant getting signage, buying advertising and paying more than one bill. Being in the mall means free security and endless parking, he said. In October, the mall opened a conference center to reclaim profitability from a vacant retail plot. "It's a different idea," Mrs. Sparrow said. "A lot of people go to hotels; no one ever thinks of the mall." She said the center frequently is booked and is as profitable as a traditional store. After working out of her home for a year, Tiffany Littrell, co-owner of Bounce Around Playworld, opened up shop in the mall seven weeks ago. The unusual venue has been a hit with mall employees, she said. "All the people who work at the mall love it," she said. "They can come eat and also play the games." And if business ever slows, Mrs. Littrell said, she enjoys being able to walk around the mall to see what's going on. The mall also has been home to a church for the past 11 months. Mercy and Truth Ministries moved from its downtown location to be more visible to local youth, co-pastor Dabeyba Taylor said. "We want to be seen just like a business wants to be seen," she said. "The Bible says that we're a light that does not need to be hidden."